Ravens appear in fairytales from all over the world, from simple anecdotes of wisdom (Aesop) to elborate illustrated stories (The Brothers Grimm). This tale,like The Twelve Brothers, The Six Swans, and Brother and Sister, features a woman rescuing her brothers. In the era and region in which it was collected, many men were drafted by kings for soldiers, to be sent as mercenaries. As a consequence, many men made their daughter their heirs; however, they also exerted more control over them and their marriages. The stories have been interpreted as a wish by women for the return of their brothers, freeing them from this control. However, the issues of when the stories were collected are unclear, and stories of this type have been found in many other cultures, where this issue can not have inspired them. 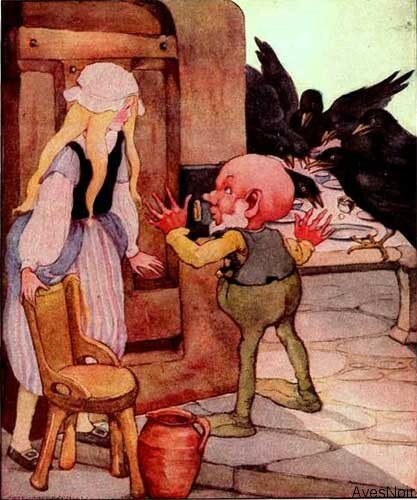 In the original oral version, there were three, not seven ravens; one study of German folk tales found that of 31 variants collected after the publication of Grimms’ Fairy Tales, only two followed the Grimms in having seven ravens. You will also notice that this later translation bears a striking resemblance to other well known fairy tales, as well as takes on the cadence of biblical prose. Following the story is aÂ wonderfully imaginative cartoon based on theÂ Fairytale. 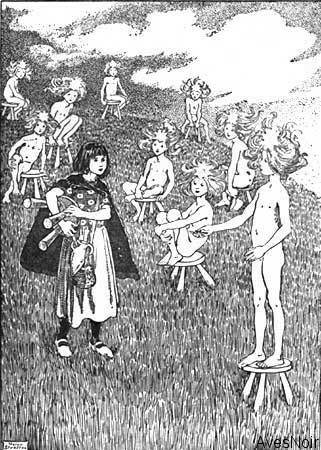 But the morning star arose, and gave her the drumstick of a chicken, and said, if you have not that drumstick you can not open the glass mountain, and in the glass mountain are your brothers.Â The maiden took the drumstick, wrapped it carefully in a cloth, and went onwards again until she came to the glass mountain.Â The door was shut, and she thought she would take out the drumstick. But when she undid the cloth, it was empty, and she had lost the good star’s present.Â What was she now to do? She wished to rescue her brothers, and had no key to the glass mountain. When the maiden, who was standing behind the door watching, heard that wish, she came forth, and on this all the ravens were restored to their human form again.Â And they embraced and kissed each other, and went joyfully home.